The Cambodia e-Visa or Electronic Visa enables travelers to apply for a Cambodia tourist visa online. The e-Visa was introduced in April 2006 by the Ministry of Foreign Affairs and International Cooperation to promote the Cambodian tourism industry. With the new e-Visa travelers can enter Cambodia for three months without any visa issuance at airports in Cambodia or consulates abroad. Instead of applying through Cambodian Embassy, all you need to do is to complete the online application form and pay with your credit card. We will email you the e-Visa document and all you need to do is print it out and bring it with you on your trip to Cambodia. 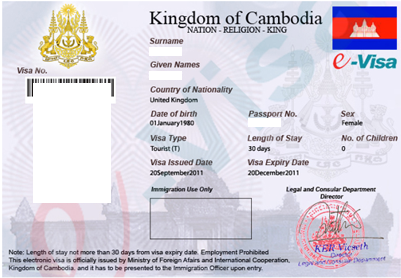 Applicant’s passport must be valid for six months from the date of entry into Cambodia. The Cambodia e-Visa is only for tourism purposes. Your Cambodia e-Visa is valid for 90 days after issue, and the maximum stay within Cambodia is 30 days. Please note that you can apply with iVisa at any time since we hold your application and apply at the appropriate time. No Cambodia e-Visa is needed for citizens from Laos, Malaysia, Philippines, Singapore, Vietnam, Thailand and Indonesia (free entry with valid passport). Your Cambodia e-Visa may be extended for another 30 days by contacting the local police station or immigration office. No sticker will be issued to you for the e-Visa. Super rush processing times for Cambodia e-Visas are approximately 24 hours. Print out 2 copies of the e-Visa certificate. Give one(1) copy to immigration as your Travel Visa upon arrival in Cambodia and one(1) copy upon departure. When you travel with an e-Visa, you can ONLY enter Cambodia through the following Ports of Entry: Phnom Penh International Airport, Siem Reap International Airport, Poi Pet (Banteay Meanchey), Bavet (Svay Rieng), Cham Yeam (Koh Kong), Tropaeng Kreal Border Post (Stung Treng) and Sihanoukville International Airport. What is the Cambodia e-Visa? What do I need to apply for a Cambodia e-Visa? What is the cost to obtain a Cambodia e-Visa? The visa cost for Cambodia e-Visa is 40 USD. Additionally, there is a service fee of 20 USD for standard processing. For rush processing and super rush processing the service fee is 50 USD and 80 USD, respectively. How long does it take to process a Cambodia e-Visa? How long is a Cambodia e-Visa valid for? It is valid for 90 days after issue. This means you must enter Cambodia within 90 days. In addition, it is a single entry visa and allows for a maximum stay of 30 days. How long must my passport be valid for in order to apply for a Cambodia e-Visa? Applicant’s passport must be valid for at least 6 months from the date of entry into Cambodia. Also, it should have at least one blank page. How long can I stay in Cambodia with my e-Visa? The maximum stay allowed in Cambodia is 30 days. What countries are eligible for a Cambodia e-Visa? The following countries are eligible for an e-Visa. Albania, Andorra, Angola, Anguilla, Antigua and Barbuda, Argentina, Armenia, Aruba, Australia, Austria, Azerbaijan, Bahamas, Bahrain, Barbados, Belarus, Belgium, Belize, Benin, Bermuda, Bhutan, Bolivia, Bosnia and Herzegovina, Botswana, Brazil, Brunei Darussalam, Bulgaria, Burkina Faso, Burundi, Cambodia, Canada (Canadian), Cape Verde, Cayman Islands, Central African Republic, Chad, Chile, China, Colombia, Comoros, Congo, Cook Islands, Costa Rica, Cote d'Ivoire, Croatia, Cuba, Cyprus, Czech Republic, Denmark, Djibouti, Dominica, Dominican Republic, Ecuador, Egypt, El Salvador, Equatorial Guinea, Eritrea, Estonia, Ethiopia, Faroe Islands, Fiji, Finland, France, Gabon, Georgia, Germany, Greece, Greenland, Grenada, Guadeloupe, Guam, Guatemala, Guinea, Guinea-Bissau, Guyana, Haiti, Honduras, Hong Kong (HK), Hungary, Iceland, India, Ireland (Irish Citizens), Israel, Italy, Jamaica, Japan, Jordan, Kazakhstan, Kenya, Kiribati, Korea, Kuwait, Kyrgyzstan, Latvia, Lebanon, Lesotho, Liberia, Libya, Liechtenstein, Lithuania, Luxembourg, Macao, Macedonia, Madagascar, Malawi, Maldives, Mali, Malta, Marshall Islands, Martinique, Mauritania, Mauritius, Mayotte, Mexico, Micronesia, Moldova, Monaco, Mongolia, Montenegro, Morocco, Mozambique, Myanmar, Namibia, Nauru, Nepal (Nepalese), Netherlands, New Caledonia, New Zealand, Nicaragua, Niger, Norfolk Island, Norway, Oman, Palau, Palestine, Panama, Papua New Guinea, Paraguay, Peru, Poland, Portugal, Puerto Rico, Qatar, Reunion, Romania, Russia, Rwanda, Saint Kitts and Nevis, Saint Lucia, Saint Vincent and the Grenadines, Samoa, San Marino, Sao Tome and Principe, Senegal, Serbia, Seychelles, Sierra Leone, Slovakia, Slovenia, Solomon Islands, Somalia, South Africa, Spain, Suriname, Swaziland, Sweden, Switzerland, Syria, Taiwan, Tajikistan, Tanzania, Timor-Leste, Togo, Tonga, Trinidad and Tobago, Tunisia, Turkey, Turkmenistan, Turks and Caicos Islands, Tuvalu, Uganda, Ukraine, United Arab Emirates (USE), United Kingdom (UK Citizen), United States (US Citizens), Uruguay, Uzbekistan, Vanuatu, Venezuela, Kosovo, Yemen, Zambia and Zimbabwe. Can I apply for the Cambodia e-Visa upon arrival? No. The e-Visa must be obtained prior to your entry into Cambodia. Is the Cambodia e-Visa for single or multiple entry? Cambodia e-Visa comes with single entry only. No. You must possess a valid passport in order to travel to Cambodia. What countries are exempt from a tourist visa to Cambodia? Do I need to enter Cambodia on the exact date specified in my e-Visa application? No, you do not. The e-Visa is valid for 90 days from the issue date, which means you can enter Cambodia any time in those 90 days. Can I enter through any point of entry with my Cambodia e-Visa? Cambodia is on many people’s list of dreamed destinations, and while some people may be the victims of misconceptions, the country has a lot of things to offer. You will experience everything from exciting trekking trails to white sandy beaches. Surely you are going to create a lot of happy memories. However, before you go, you should read a little bit about the country and its customs. It will definitely improve your overall experience. Doing some research on the destination is always a must, so why would Cambodia be any different. One of the first things you need to concern yourself with is health. The most common inoculations people have before traveling to Cambodia is Hepatitis A and Typhoid fever. Yellow fever is also something that can occur. That is why you should go and talk to your doctor before departure. You will get the vaccinations, and you should be fine because the diseases mentioned above are entirely preventable. Another health advice would be to avoid tap water and consume only bottled water. That way you can save yourself from some unpleasant situations. The second aspect is your visa. Only 9 nationalities are visa exempt when traveling to Cambodia. If you are not on that list, you need to obtain a visa. Lucky for you, there are multiple ways to meet that requirement. You should know that all nationalities can get a visa on arrival once they land in Cambodia. It does not cost much, but you do need to stand in line at the service counter. Even so, it is still better than going to an embassy. Another option would be for you to apply for a visa online. The electronic visa system in Cambodia is available for all nationalities except for the citizens of Nigeria. However, keep in mind that an electronic visa is accepted only at a handful of checkpoints, so make sure that you arrive at one of them if you apply online. If you are searching for the best time to Visit Cambodia, there is no straight answer. It depends on what you want to experience and how. However, since Cambodia has a hot climate, the best time to visit is November through March. That way you can avoid all the heat. For example, if you want to visit the Angkor Wat in July, you are going to have a terrible time. Especially at midday. The rocks get so heated that you can barely breathe. As you can imagine, most tourists visit Cambodia from November through March, so you should expect large crowds in the popular destinations. On the other hand, if you want to visit the country in its shoulder season, July or August is what you want. You can expect high temperatures as well as rain. Lastly, if you wish to avoid both the heat and the crowds, you can try April and June or September and October. Keep in mind that September and October are pretty wet, and that may ruin your vacation. As for currency, the official currency in Cambodia is the riel. However, you would be surprised to find out that US dollars are accepted almost everywhere you go. So, no matter where you come from, we recommend that you exchange your money to US dollars. In this way you will have money wherever you may go, and it will be easier for you to make the exchange when you go back to your country of origin. You can change USD everywhere, while not many places accept the riel. If you plan to buy souvenirs for the people back home, you may want to learn how to bargain. Or, if you already know, do not hesitate to use your skills when you go to markets or souvenirs shops. Like most Asian countries, the people in Cambodia are up for a good bargain, and you may succeed in shaving off some dollars of the asked price. It is fun both for you and the merchant, and you can save some money in the process. Communication is not as easy as you may think. Cambodia is a country in which multiple languages are used. People there speak Khmer, which is the traditional language, but they also speak Chinese. You can speak English but Cambodians somewhat speaks broken English. You may or may not understand what they are saying, and the same goes for them when it comes to following you. That is why we recommend that you learn some basic expressions in Khmer before you go. That way at least you can ask for food and accommodation. Something else that you should know is that you must protect yourself from mosquitos. There are a lot of them in Cambodia, and some species carry diseases. If you get vaccinated before you go, that should not be an issue as far as your health is concerned. Nevertheless, mosquito bites are not comfortable and you do not want to be itchy the entire trip. We recommend that you bring with you bug repellents so that you can be bite-free for the whole trip. If you want to go to the beach, beware of the sand fleas. They are annoying creatures that will ruin your vacation. Make sure to have a repellent for those as well. Last but not least, do not forget to explore the Cambodia culture. The most popular destinations are Siem Reap and Phnom Penh, but they are relatively large cities. Everyone visits the Angkor temples but do not forget to explore the rural areas as well. You will meet interesting people, learn about their traditions, and the food is fantastic. You can join a lot of groups, and you can find the most exciting activities. Surely you will have a lot of fun. Cambodia is a developing country, and you may find things that you do not like. Petty thieves are one of those things, and beggars are well. However, they are found mostly in the larger cities. Apart from that, Cambodia is a beautiful country with amazing scenery. You will create unforgettable memories.